Prison Pet-1948 chestnut. Sired by Alkatraz, out of *DSB Aradia's Pet (ITY) who is owned by Brenda Varian. 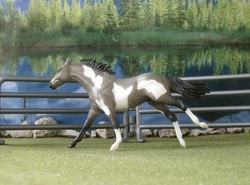 OF Breyer SM running TB. Ill Go To Prison-1948 black. Sired by Alkatraz, out of Babys Breath (r). Shown here as a foal, baby black. Lady Prison-1949 black. Sired by Alkatraz, out of Lady In Black (r). Zever Get Caught-1953 bay. Sired by Zever Quit, out of Ill Go To Prison. Dusty Memories-1963 buckskin. Sired by First Corsair, out of Fantan (r). Bred by Celtic Song Stables. 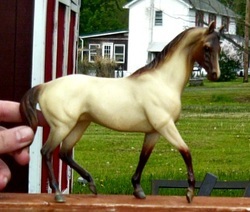 OF Breyer SM standing TB. Pet Me-1964 buckskin. Sired by First Corsair, and out of Prison Pet. Pic Credit @ Deb Vince. 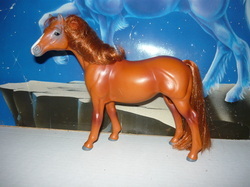 Silky Pet-1973 chestnut. Sired by Silky Sullivan (r), out of Prison Pet. Quadroon's Ball-1978 black. Sired by Quadrangle (r), out of Staretta (r). Nimue-1978 black. Sired by Needles (r), out of Witching Hour (r). Last foal crop of Needles with only three foals. Lady In Waiting-1982 dark bay/brown. Sired by Uruguayo (r), out of The Bride (r). 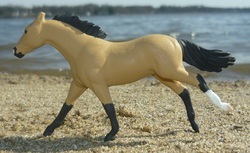 Saga Begins-1982 buckskin. 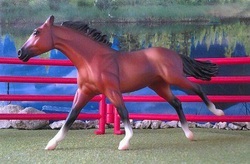 Sired by Milkie-r, out of Leisure Road-r.
CM Breyer SM running TB painted by me. At Shadow Wolf Stables but coOwned with them. 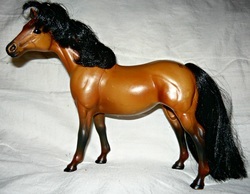 Shergar's Legacy-1983 buckskin. Sired by Shergar (r), out of Dusty Memories. We sent Dusty to Shergar who stood in Great Britain and Ireland for only one season. He was kidnapped and never seen again shortly before his second season at stud was going to start. It's a real shame. Crystal Sorceress-1983 smoky black. Sired by Corporal Punishment, out of Nimue. We decided to paint her for Halloween and she had a blast! The Druid-1985 bay. Sired by Any Card Will Do, out of Sweet Treats. Bred by Celtic Song Stables. 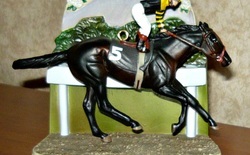 OF Breyer classic, Jet Run. Lockindowntheball-1986 black. Sired by Lockdown, out of Quadroon's Ball. 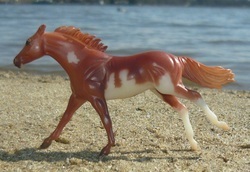 Alisheara-1986 buckskin. Sired by Alydar (r), out of Dusty Memories. 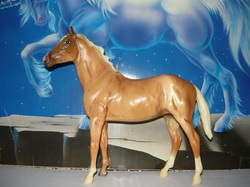 Pesty Memory-1987 gray (buckskin base). Sired by Pesty Axe (r), out of Dusty Memories. 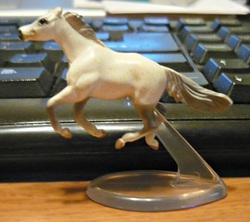 Skydancer-1987 gray (black base). 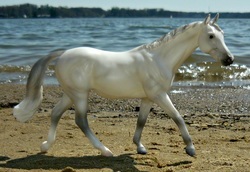 Sired by Seattle Slew-r, out of Shy Vita-r.
OF Grand Champion, Lipizzaner, Skydancer. 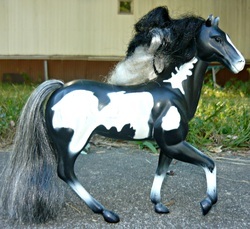 Been Busted-1988 dapple gray (black base). Sired by Seattle Slew-r, out of Shy Vita-r. Punishing Witch-1988 buckskin. Sired by Corporal Punishment, out of Wicked Witchcraft (r). Renaissance-1988 chestnut. Sired by Star Wars, out of Specialization (r). Snowtail-1989 bay rabicano. Sired by Music Prince (r), out of Leykin (r). 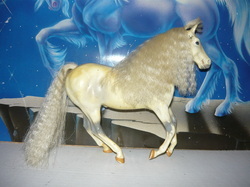 Another Saga-1990 Gray (buckskin base). Sired by Relaunch-r, out of Saga begins. 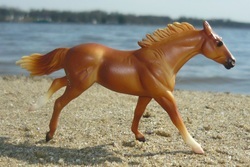 Devious Queen-1990 flaxen liver chestnut. Sired by Decidedly Devious, and out of Island Kitty (r). Bred with the help of Celtic Song Stables. 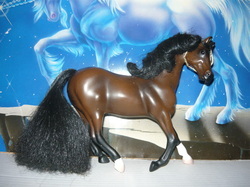 Yet Another Saga-1991 sooty buckskin. Sired by Relaunch-r, out of Saga Begins. Nanotyrannus-1992 bay. Sired by American Promise (r), out of Megaraptor. Bred by ? 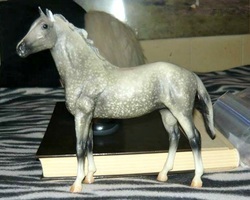 Catchin Zees-1992 gray (black roan base). Sired by Catch A Bird (r) (NZ), out of Murmurs (r) (NZ). Sky Breaker-1992 dapple gray (bay base). Sired by Jailbreak, out of Skydancer. 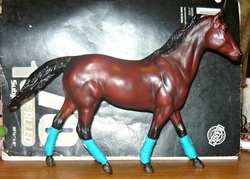 War Dancer-1993 bay. Sired by Star Wars, our of Skydancer. Half sister to many horses in the herd. Shown here with Beginning Warrior, her Paint colt. Azure Jewel-1993 bay/brown. Sired by Relaunch (r), out of Azure Blade. Bred by Legacy Farms. 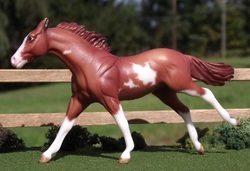 Full sister to Figure and Ze Launch whom I both own. 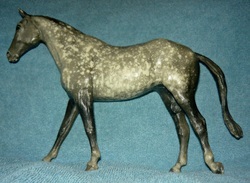 Pure Divinity-1993 gray (bay base). Sired by Icecrown Citadel, out of Always Scheming (r). Better pic to come later. Catchin Fire-1994 chestnut minimal sabino. Sired by Illumination, out of Mafia Rules. Bred by Lisa Johnson James. 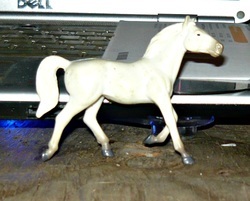 OF Breyer, Ruffian, Rags To Riches. Red Gin-1994 chestnut. Sired by Beau Gin, out of Red Goddess. Bred by Shadow Wolf Stables. 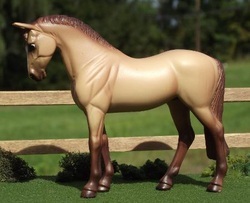 Deviant Light-1996 flaxen sooty chestnut. Sired by Right of Light (r), out of Devious Queen. 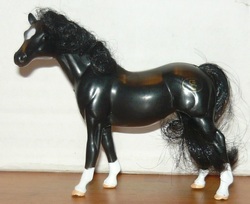 OF Breyer Classic Black Beauty, Cloud's Legacy. Call Me Dangerous-1995 chestnut sabino. Sired by Margquerty (r), out of All Flash No Cash (r). Ororapter-1995 bay. Sired by Mr Prospector (r), out of Megaraptor. Bred by? 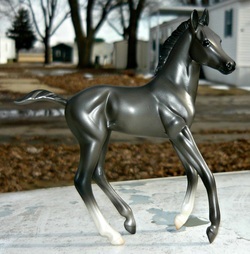 Sky Isthe Limit-1995 dapple gray (black base). Sired by Figure, out of Skydancer. 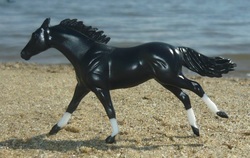 Dancin Figurine-1996 bay. Sired by Figure, out of Skydancer. 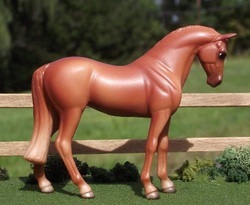 Little Red Rum-1996 chestnut sabino. Sired by Rum Runner, out of Little Red Dress. Bred by Lake Hill Ranch. Currently a BSO but would like a SM to fill this spot. The Wicked Crystal-1996 buckskin. Sired by The Wicked North (r), out of Crystal Sorceress. 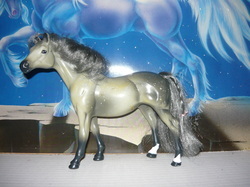 Glass Saga-1996 gray (buckskin base). Sired by Glass Spider, out of Yet Another Saga. Bred with the help of Rocking M Ranch. 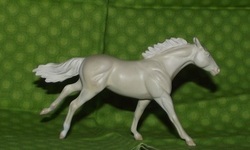 OF Breyer Trad, Touch Of Class. 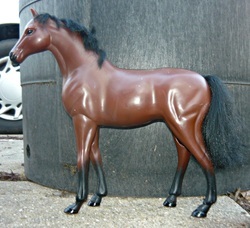 Faze Me None-1997 liver chestnut. Sired by Inchinor (r), out of Saga Begins. Bred in England and came back to the USA in utero. Full sister to the buckskin stallion, Vakarian that we stand. 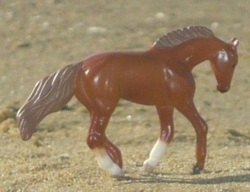 OF Breyer, Gem Twist, Sapphire. Dancing Figures-1997 gray (bay base). Sired by Figure out of Skydancer. Full sister to the gelding KSW Duke. Satin Spider-1997 gray (buckskin base). Sired by Glass Spider, out of Saga Begins. Bred with the help of Rocking M Ranch. 3/4 sister to Glass Spider. I Am Queen-1998 chestnut. Sired by Figure, out of Red Goddess. Bred with the help of Shadow Wolf Stables. Skywriter-1998 dark bay/brown/black. Sired by Figure, out of Skydancer. 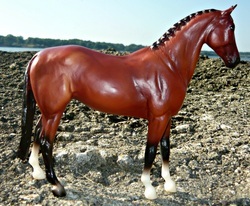 2003-Reserved for a bay foal. Pale Escape-1998 cremello. Sired by Solitary Confinement, out of Alisheara. Pic taken by Tracey Bartone of Shadow Wolf Stables. Crime Stop-1998 palomino frame overo and sabino. Sired by Solitary Confinement, out of Dance Spot (r). 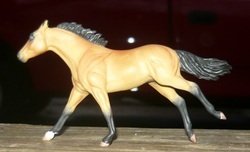 Custom Breyer done by Heather Bruen. 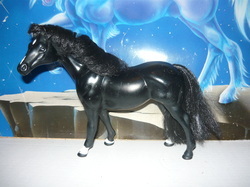 Haunted Whispers-1999 dapple gray (black base). Sired by Figure, out of Skydancer. Slew Indeed-1999 black. Sired by Slew Me In, out of Yes Indeed. Bred by Twin Springs Stables. 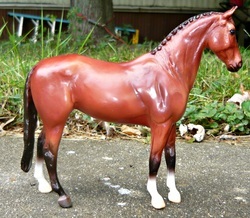 Catch An Error-1999 chestnut roan. Sired by Marauding (r), out of Slip Catch (r). Bred in Australia and imported as a yearling. It appears Roan is a new mutation in the TB gene pool as the only known source is through the stallion Catch A Bird who was a bay brindle yet he sired 4 known roan looking foals. 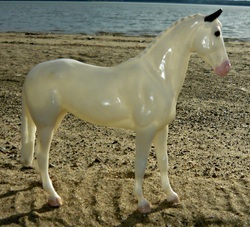 http://whitehorseproductions.com/tbcolor_roan.html This website will tell you more! 2005-Book of Secrets, palomino roan filly (x National Treasure) o/b Celtic Song Stables. Installing Updates-1999 buckskin. Sired by Rhythm of the Sea, out of Tea & Glitter. 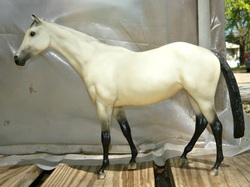 CM Breyer SM G3 TB by Tracey Bartone. CoOwned with Shadow Wolf Stables. 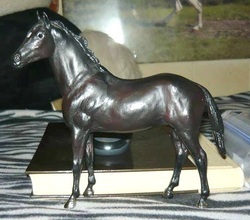 2004-Reserved to Merlin's Folly for a perlino foal. Sky Fig-2000 Gray (black base). Sired by Figure, out of Skydancer. Full sister to the gelding KSW Duke. Lava Lake-2000 chestnut. Sired by Rahy-r, out of Genuine Risk-r.
Sky Forge-2001 bay. Sired by Figure, out of Skydancer. 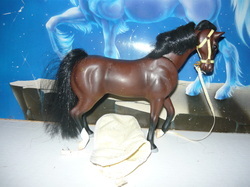 OF Breyer, SM, Standing TB, Super Sporty. Jewel Remarks-2001 bay frame overo and sabino. Sired by Racey Remarque (r), out of Azure Jewel. Credit to whoever took the pic. Hidden Queen-2001 chestnut. Sired by Hidden Royalty, out of My Sweet Queen. Bred by Shadow Wolf Stables. 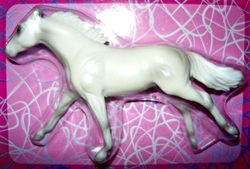 FrostedGoldenDesire-2002 palomino sabino/DW. Sired by Sato (r), out of It'sSnowingOnStage. Bred by Sentinel Farms, IA. Prewarned-2002 bay. Sired by Dark Citadel, out of Preselected. Bred with the help of Celtic Song Stables. 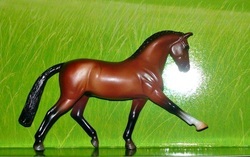 OF Breyer Classic Might Tango. Pic to come soon. 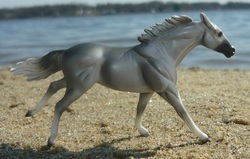 The Frozen Oath-2003 gray (buckskin base). Sired by Icecrown Citadel, out of Pale Escape. Raid Wipe-2003 gray (smoky black base) frame overo and sabino. Sired by Icecrown Citadel, out of Crime Stop. 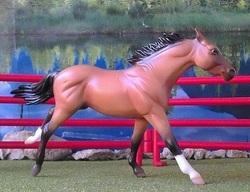 OF Breyer running TB mare SM. 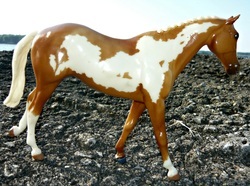 Saga Sequins-2004 buckskin. Sired by Skippin Sequins, out of Yet Another Saga. Has scars on legs from running into barbed wire fence as a youngster. Never made it to the track due to this. Tizlaunch-2004 bay. Sired by Awesome Again-r, out of Tizso-r.
One Pale Crystal-2004 cremello. Sired by Vakarian, out of The Wicked Crystal. 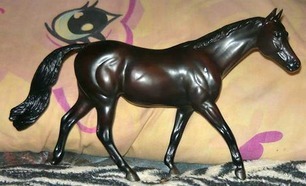 Solitaire Slew-2004 smoky black. Sired by Solitary Confinement, and out of Slew Indeed. 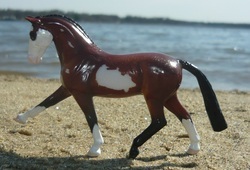 Cantstopthedark-2004 brown/black frame overo. Sired by Dark Citadel (IRE) x Crime Stop. Ignore the picture, need to pull the one off my flash drive. Splash That-2005 Bay splash(?) Sired by Occidental Tourist-r, out of Hey What The-r. Bred in New Zealand and imported as a weanling. No tests have been done to confirm splash is even in the TB breed. And it's only cropped up in this one line so far. And only in New Zealand. CM Breyer, SM, Running TB mare done by Unknown. 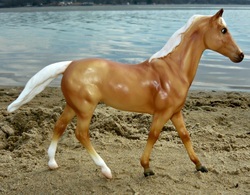 I bought her at Breyerfest and there's no signature on her. Saga Me This-2006 palomino. Sired by Figure, and out of Saga Begins. currently a BSO at this time. 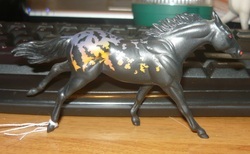 War Lava-2006 gray (black base). Sired by War Saga, out of Lava Lake. On her sire side she goes back to Man O'War twice: once through her grandsire by the way of War Admiral and once through her granddam by the way of War Relic. Achromatic-2006 bay. Sired by Golden Winner, out of Chromatic. Bred by Decor Stud in Sweden. Imported as a 2 year old in training. Michele's Asami-2006 Dominant White (black base). Sired by Lonhro (r) and out of Shirayukihime (r). The dam is the start of her DW line. 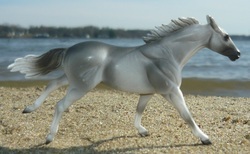 Custom Breyer, Jet Run (classic scale) etched by Michele VonHagen and touch ups by myself. Snow Be it-2007 black. Sired by Shadow Passage, out of Snow Goddess. Saga Me That-2007 palomino. Sired by Figure, and out of Saga Beings. 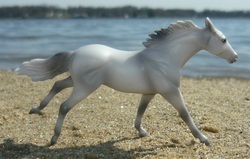 Etched To Win-2008 Chestnut sabino, one blue eye. Sired by Sato-r, out of Subtle Aly-m. Bred by Shadow Wolf Stables. Etched by Cassandra Knipp. Photo was done by Tracey Bartone of Shadow Wolf Stables. Tribal Legend-2008 dark bay. Sired by Tribal Rule-r, out of Eternal Legend-r.
OF Grand Champion Feed N Nuzzle mare. The Omen-2008 palomino. Sired by Blood Omen, out of The Frozen Oath. Color Of Glory-2009 chestnut rabicano. sired by Colorful Tour (r), out of Close To Glory (r). 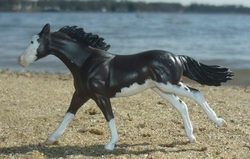 She Devil-2009 black frame overo. Sired by Shadow Passage, out of True Betrayal. Bred by Shadow Wolf Shadows. Twisted Sense-2010 Dark bay/black. Sired by Figure, out of Twisted Words. Bred by Shadow Wolf Stables. One of Figure's last foals. 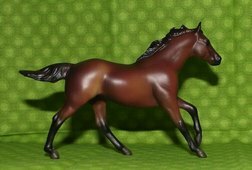 OF Breyer Black Caviar, trad. My Elemental-2010 bay. Sired by Figure, out of Skydancer. 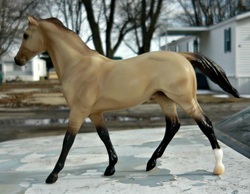 Rising Seduction-2011 Palomino sabino/DW. Sired by Sato-r, out of So Risen. Bred by Shadow Wolf Stables. Full sister to Royal Risen. 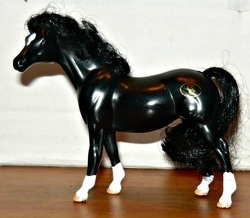 Cm Breyer SM dressage, done by the ever talented Cassandra Knipp! 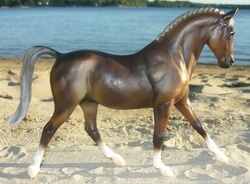 Is always Live Shown as a Dutch Warmblood stallion, has placed already. White Out-2011 buckskin Dominant White. Sired by Vakarian, out of Michele's Asami. Just Blame Me-2012 dark bay. Sired by Blame-r, out of Dynaffair-r.
OF Grand Champion Willow Wind. Live By The Creed-2014 bay frame overo. Sired by Assassin, out of She Devil. CM by me. Gloss finish has screwed up. The Golden Witch-2014 palomino. Sired by Assassin, out of Punishing Witch. Figure In Ice-2015 bay rabicano. Sired by Figure, out of Snowtail. Sneaky Witch-2015 buckskin. Sired by Figure, out of Punishing Witch. What A Beech-2016 bay splash (?). Sired by For Fox Sakes, out of Splash That. Catch Me Some-2017 bay roan. Sired by American Pharoah (r), out of Catch An Error (AUS). One Pale American-2017 buckskin. Sired by American Pharoah (r), out of One Pale Crystal. Wicked Cleopatra-2017 palomino. Sired by American Pharoah (r), out of The Wicked Crystal. The Chromed Saga-2018 buckskin. Sired by California Chrome (r), out of Glass Saga. Californian Sky-2018 brown/black. Sired by California Chrome (r), out of Sky Isthe Limit. Chromed Jewel-2018 chestnut. Sired by California Chrome (r), out of Azure Jewel.